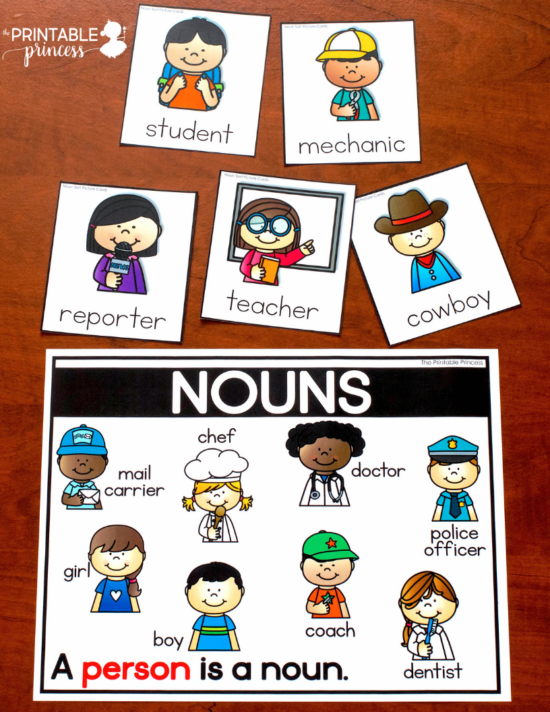 Nouns are one of the first “official” parts of speech we teach in Kindergarten. Most kindergarteners have never heard of the term noun. 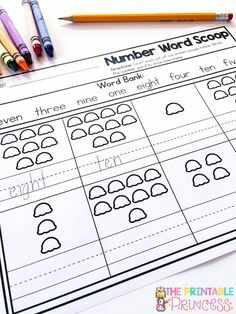 When introducing your nouns activities for Kindergarten, you might ask your class “what is a noun?” and have 20 or 25 little faces staring blankly back at you. 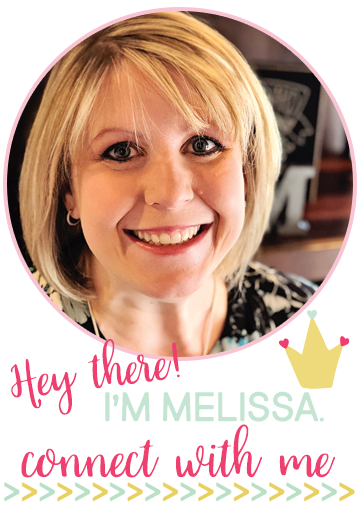 But if you were to rephrase and ask “do you know what a person is?” or a place or a thing, your students have a ton of prior knowledge on those topics. Activating their background knowledge is a great first step in teaching nouns. 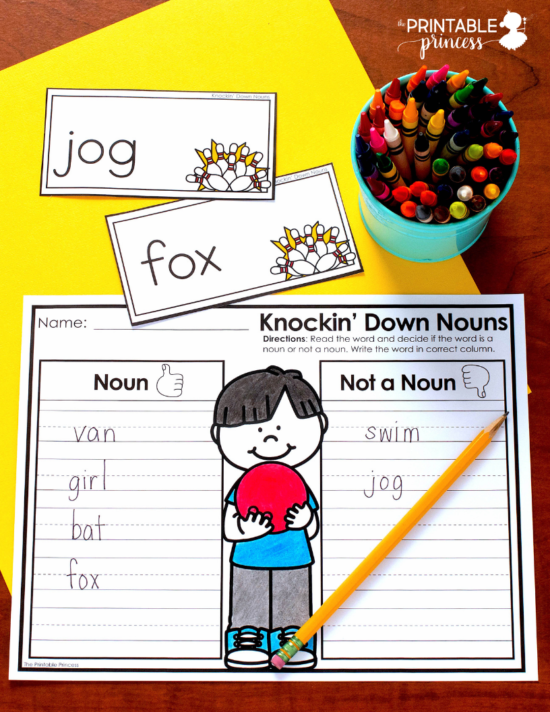 To really give students a solid understanding of nouns, it requires a lot of practice. 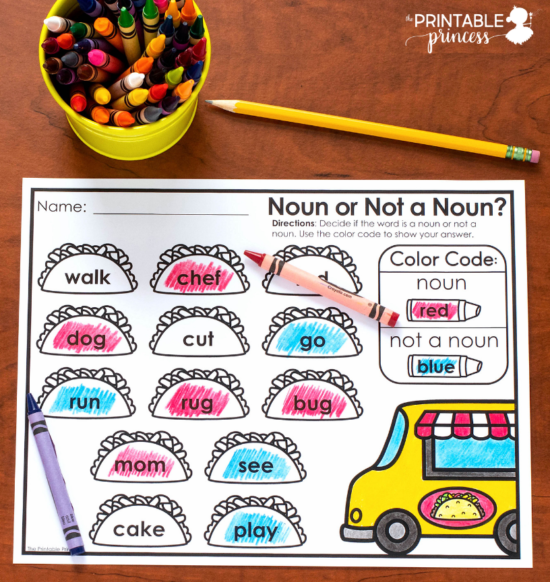 Before we introduce common and proper nouns or singular and plural nouns, it’s a great idea to get kids to really understand what a noun is and what it is not. This is why I created our new Nouns Activities resource pack. 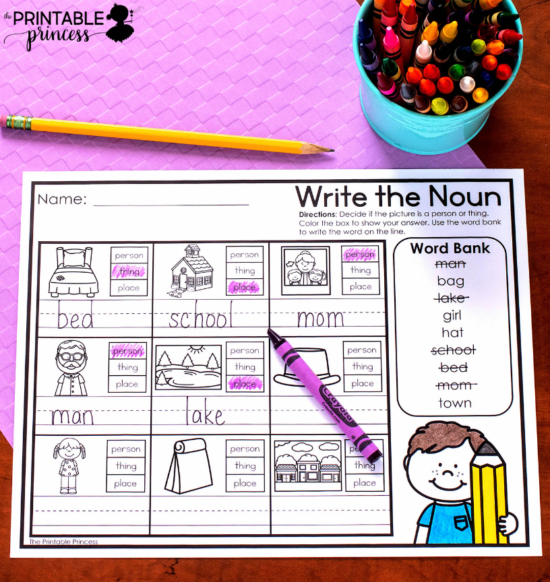 This resource was created to help you introduce the concept of nouns to your students. 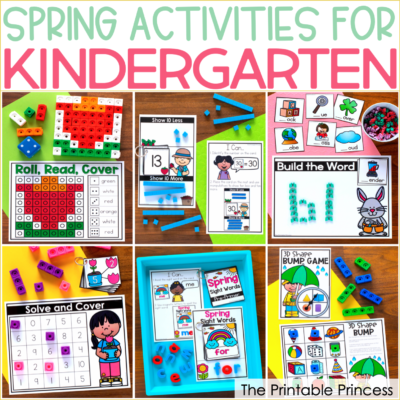 Inside you’ll find lots of options to help you plan out your nouns activities for Kindergarten. 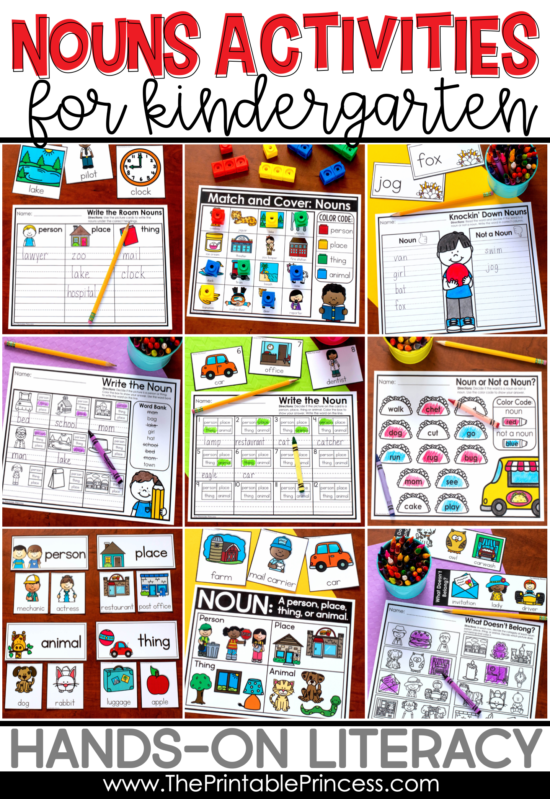 It includes picture sorts, centers, no prep pages, and display posters to help you introduce the concept of nouns to your students. 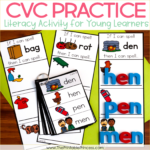 The activities are designed to help students be able to recognize and classify a noun as a person, place, thing, or animal. 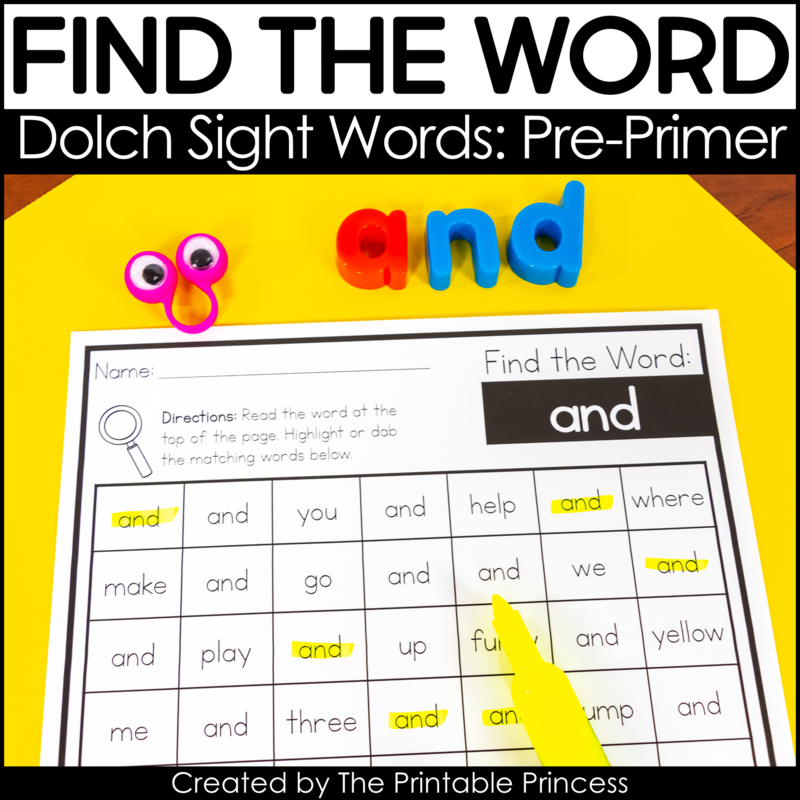 The pages included are easy to prep and most importantly, little learner friendly. 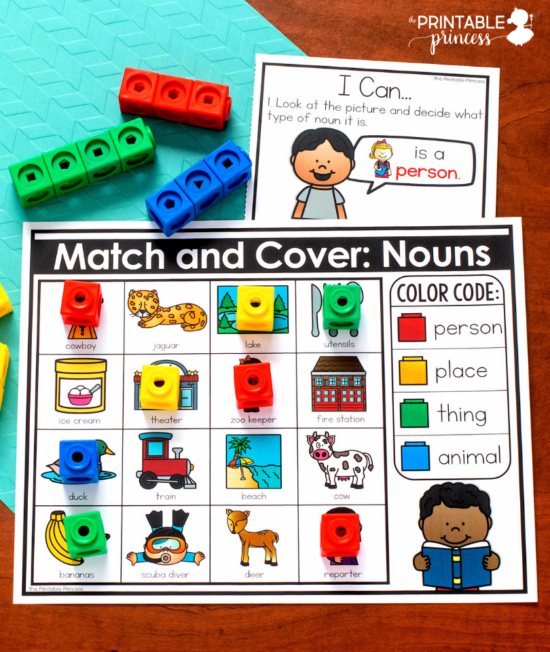 These activities provide a fun, hands-on approach to teaching nouns. 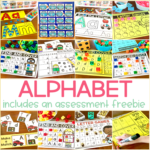 In this resource you will find a variety of activities. 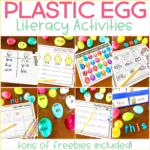 Activities are included for whole group, small group, and independent learning stations. 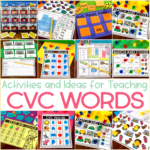 You’ll want to be sure to introduce the activities with your students and go over the picture names before having students complete the activities independently. 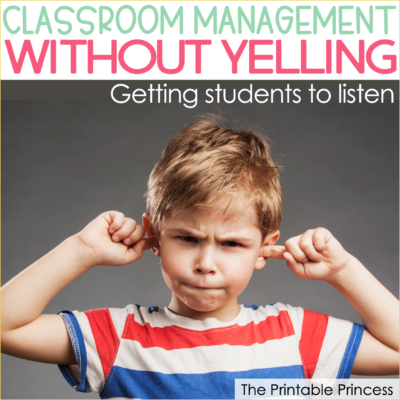 Posters are a great way to start a lesson or use as a talking point during the lesson. 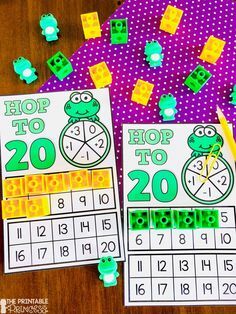 They are also perfect for display in the classroom as a visual reminder or reference. 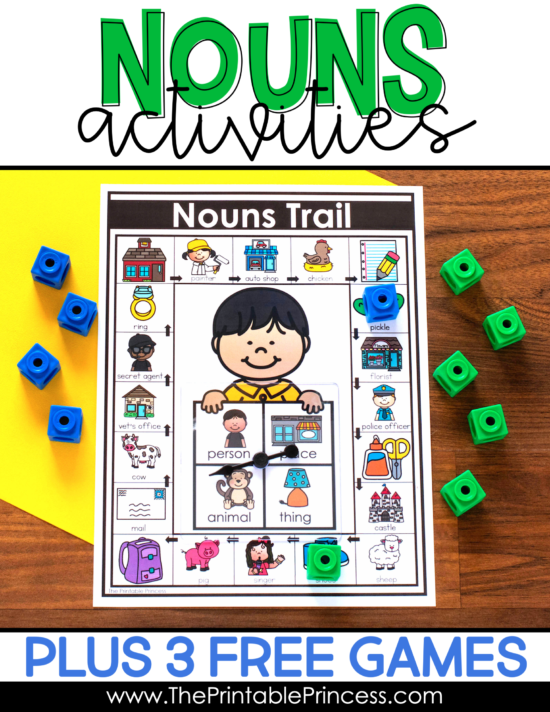 The Nouns Activities resource includes a set of 6 noun posters that give an overview of a noun as well as separate posters for a person, place, thing, and animal. Works great for classroom display, an introductory lesson on nouns, and whole group discussion. 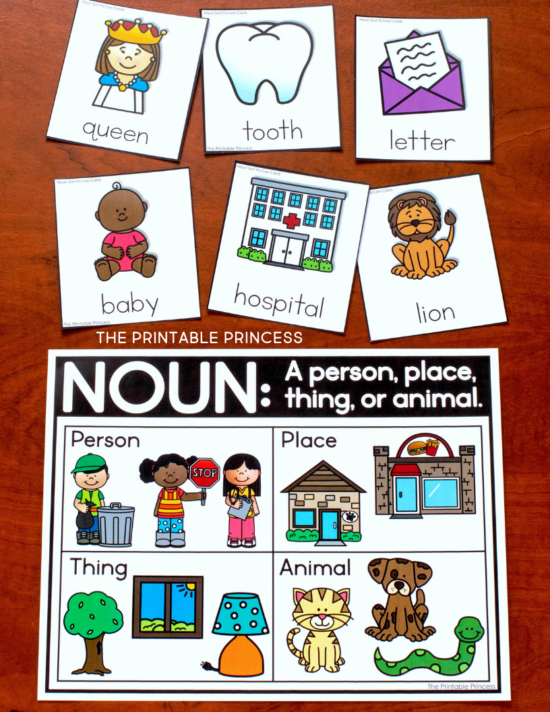 The nouns resource also includes person, place, things, and animal headers with 72 picture cards. You can use the header and picture cards as a pocket chart sort or turn it into a center with the recording sheet that’s included. Students sort the picture cards using the noun headers. To show their work, they will write the picture names under the correct heading. Students will need red, yellow, green, and blue plastic linking cubes for the activity mats. 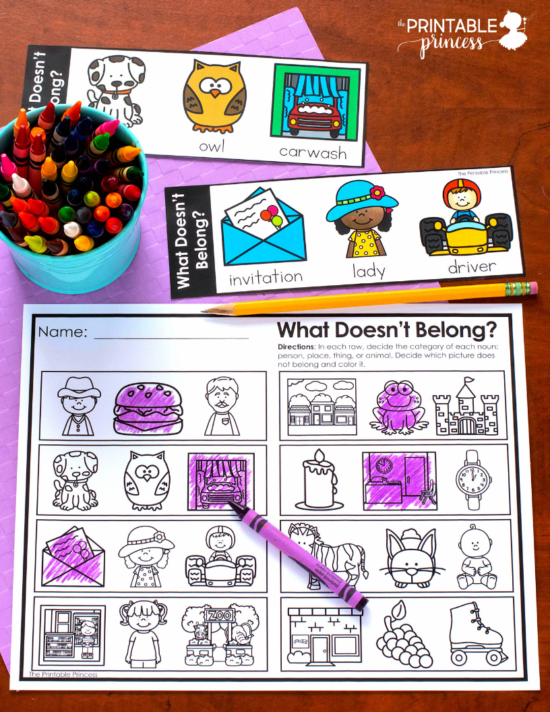 For this activity, students look at each picture to decide what type of noun it is. They use the color code on the right of the mat to cover the pictures. This resource includes 7 center activities to help your students solidify their understanding of nouns. Here’s a look at a few of those centers. Students decide what kind of noun each picture is to determine which one does not belong. They find the matching set of pictures and color the one that does not belong. Students identify the picture on the card to determine if it is a person, place, thing, or animal. They write the word on the line and color the space to show their answer. Students walk around the room to find the picture cards. They identify the picture and determine if it is a person, place, or thing. They write the word under the correct heading. Students will read the word to decide if it is a noun or not a noun. They will write the word on the paper under the correct heading. 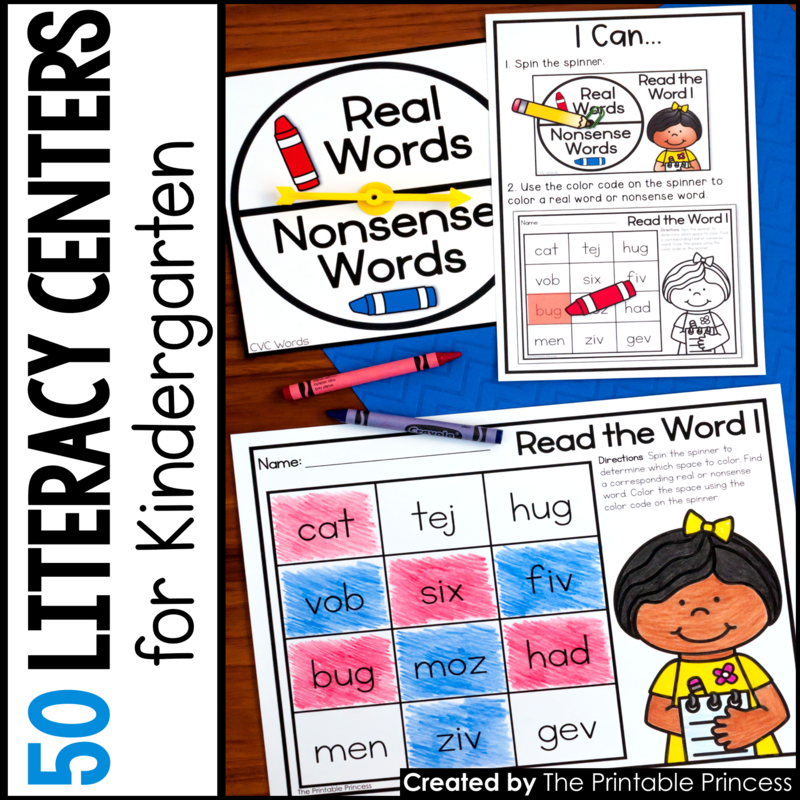 Along with picture sorts, centers, and games the Nouns Activities for Kindergarten resource also includes a collection of no-prep activities. 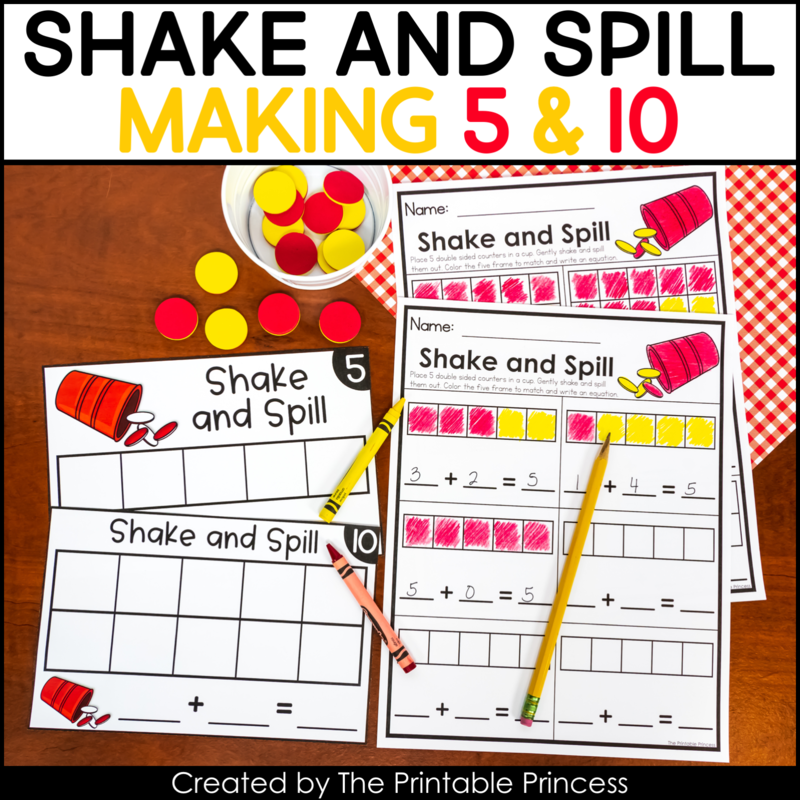 No prep activities include cut and paste activities, writing prompts, and coloring response pages. 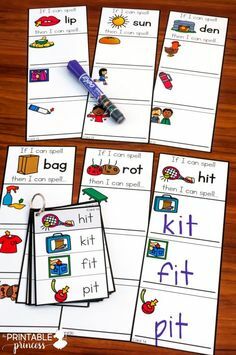 There are a range of skill levels included – from a “basic introductory to nouns pages” to higher level learning pages like the ones pictured below. 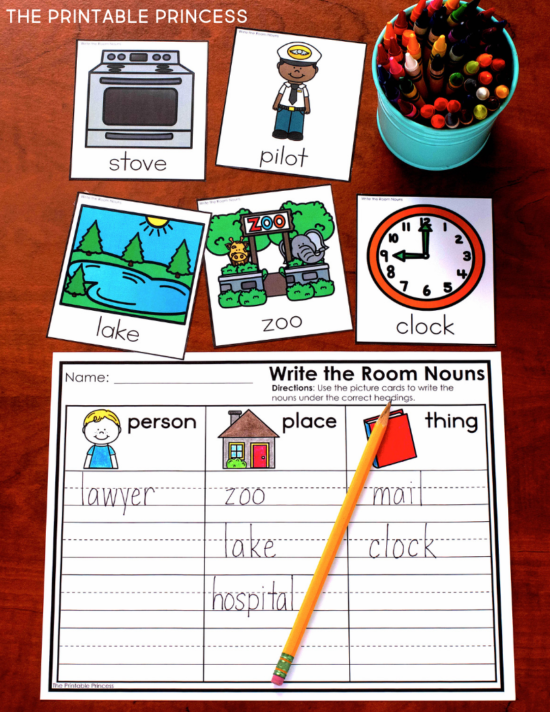 Separate pages for person, place, thing, and animal are included as well as general noun practice. Students read each word to determine if the word is noun or not a noun. They use the color code to color the taco. For this page, students say the name of each picture and write the word, with the help of the word bank. They color the space to show if the picture if a person, place, or thing. 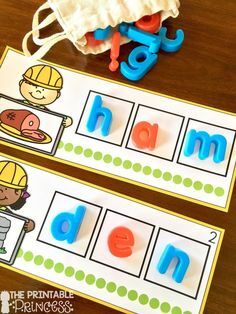 These little games is perfect for practicing nouns because they are interactive and engaging. The school theme makes it perfect for any time of the year. So it’s great to pull out and play when you’re class is covering nouns! 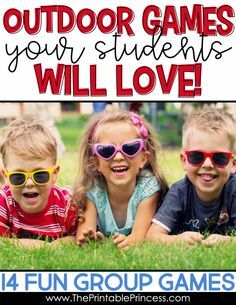 Plus it’s hands-on and fun – which is just the way that Kindergarteners learn best! 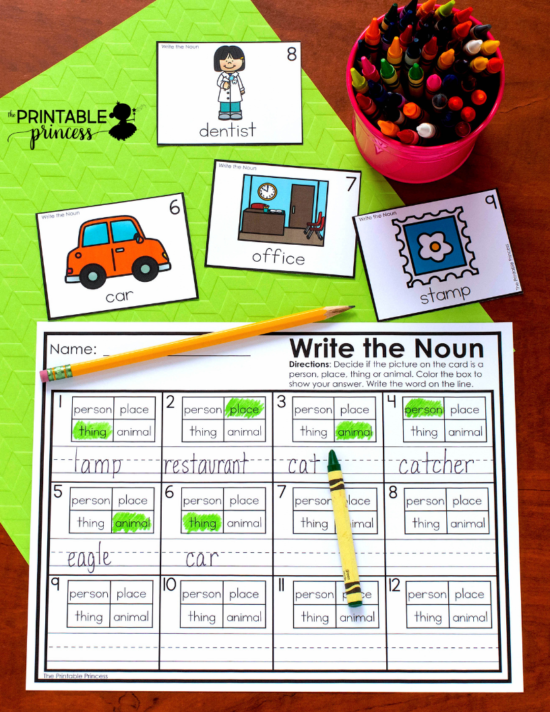 To prepare these Nouns Activities for Kindergarten print and laminate the game mats so you can use it over and over. 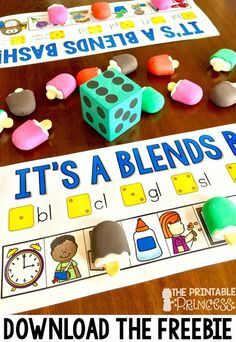 Students will need a game piece such as a mini eraser or plastic cube for this activity. 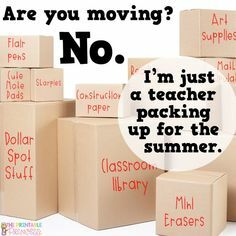 They will also need a plastic spinner (my favorite kind!) or a paperclip and pencil to make a spinner. 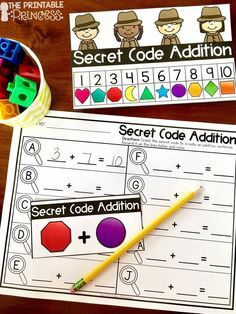 Students can play this game independently or with a partner. Students start on the schoolhouse. They spin the spinner and identify person, place, thing, or animal. They move their game piece to the nearest space with the matching type of noun. The grayed school supply spaces are free spaces. The first player to make it back to the schoolhouse is the winner. To win the game, the player must spin the exact noun needed to reach the schoolhouse. 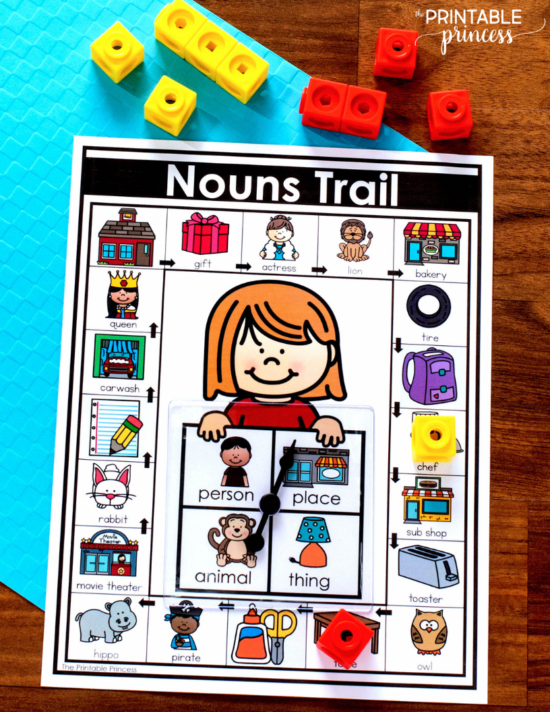 You can download your copy of the Nouns Trail game by clicking here. 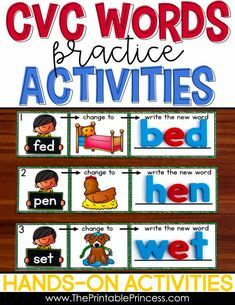 In addition, if you’re looking for more Nouns activities for Kindergarten click here.